Conscious Stage – How to evaluate your buying decisions. Organizations at this stage are just beginning to realize all that is involved in multilingual communications. The Conscious stage is still very project driven, but projects become more repeatable and cost awareness is growing. Organizations are testing out new markets. How do I protect my brand identity in foreign markets? It’s normal at this stage that organizations try to go through local affiliates (this could be your distributor, employee within a local office, etc.) for basic translation needs as local affiliates know the needs of the audience, are knowledgeable of the subject and provide a low cost option over a translation vendor. However, local affiliates usually lack time to translate materials on time and brand consistency is often a concern. It’s a challenge to control brand messaging and design standards over different local affiliates. Each have their own processes, resources and insights. We have seen with organizations in this stage, that decentralized efforts usually end up in dissatisfaction because decisions made at the local level do not align with the organization’s expectations. We find that the centralization effort is one of the first major efforts or organizations to think about process improvements in translation management. Local affiliates are very useful in the process, but management of content and design needs to be controlled. What can I expect from my vendor at this stage? Aside from managing dedicated subject matter experts in client specific teams, in the case of centralization, your translation vendor should be the catalyst for process improvement. Translation becomes a cycle of content management, terminology and translation management and review management where the translation vendor can play a central role. Also Read: Global Communication Audit; It’s our assessment model to assess the organization’s needs for process improvement efforts that make the most impact at each stage of maturity. Process management becomes a problem and a vendor should be able to control the process from release through translation, review and final product. Also, each step is managed so that the brand messaging is protected. There is an important role to play in understanding what could hurt the brand and how it should be managed from a design and terminology perspective. Vendors should be empowered with this information in order to manage and vendors should have excellent control over review processes with local affiliates and understand the dynamics at play. Readiness Categories as it relates to management levels in the organization. Also, a vendor should help to start you on the path of standardization. Style guides are very useful at this stage to define what elements are part of the global brand vs. what elements are local and how they should be implemented consistently. 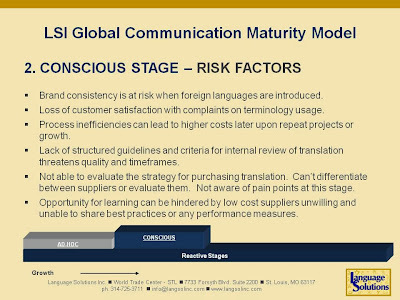 Organizations should rely on their translation vendor to have a process in place and to suggest process improvements. 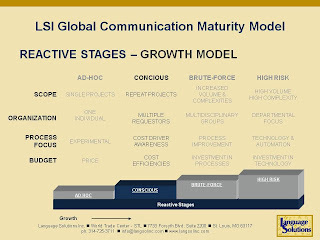 We have defined clear objectives and processes in our Language and Design Readiness Categories that are directly applicable to this stage of growth. What input can I deliver in collaboration with my translation vendor to contribute to a positive outcome? In earlier blog posts, we’ve written that it is important to protect the brand messaging. Translation is almost becoming a threat to brand consistency if not managed well. With your trust that your vendor will handle the management of the translation process, a successful outcome cannot be achieved without a clear understanding of the brand and brand messaging. Collaboration early on is essential to establish an understanding of the organization’s goals and desired outcomes. Also, management of people and expectations need to be communicated from the organization to all parties. Too often have we seen that organizations who cannot commit to the process end up back to managing decentralized efforts, or at least, growing cost inefficiencies. What processes do I optimize at this stage? 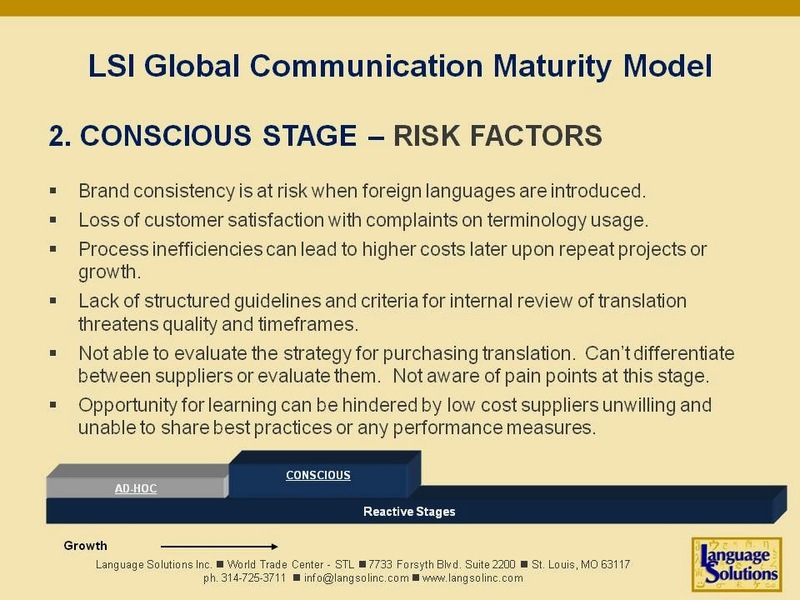 Considering that your translation vendor is trusted with most of the translation management, there are still processes that the organization can start to work on. In the Language and Design categories, we work to optimize the content and design creation process and make sure that the output is optimized for translation as well. Organizations should focus on small efforts with their writing staff and design team to plan projects ahead and standardize the output for translation.Global style guides are also a good start as well as Translation and Terminology management together with Corporate Glossaries. This is an asset building exercise that requires input from the organization as well. What are my risks? Consider that at this stage, your commitment to translation is growing. Translation work can quickly take its own path without any consideration for your brand or product. Consider that your brand is worth protecting as it is the brand and quality of work that brought you this potential. By taking care of your brand at this stage with a dedicated translation vendor that can manage your centralization efforts early on and by supporting the process as much as possible, the risks at this stage can be mitigated.